For us, anyway. We’re going to Europe. I’ve been in an absolute lather preparing for it on top of the usual end of year stuff, it’ll be a relief just to unburden my brain onto the Internet just so I can see where I’m at. We’ve booked the tickets, done the passports and travel insurance, and booked some accommodation. Sometimes we’re going to wing it, other times we know where we’re at. Last time I went to Europe the Internet did exist, but only in a very limited form. I could pop into Eindhoven University to online chat to my boyfriend in Sydney for free (split screen, all blinking green text on a black background, just like in the movies!) but that was the extent of it. I think the World Wide Web was actually invented that year. If you wanted to book accommodation, you had to physically lug yourself and backpack there anytime after two and enquire as to rates and bedbug densities. Time consuming. I’ve just got to book a car, but that’s it for the Europe side of things on my to do list. Apart from getting an international drivers license, just in case the husband can talk me into driving. Which means I’ll need a passport photo. Ok.
I’ve borrowed luggage (thanks Aunty Sarah!) and warm coats (thanks Karen!). I’ve paid the phone bills twice. I’ve arranged the house sitter, his girlfriend is coming for coffee tomorrow, even though it’s her birthday. I wonder if she’d like some lemon slice? I’ve had the kitchen and bathroom painted. You didn’t hear about that because it was very uneventful and they were really nice. Didn’t complain about moving the furniture or anything, unlike almost every other tradesman ever. Suspended my gym membership. Used my Athletes Foot voucher to buy a new pair of running shoes before it expired. They weren’t the very best ones I tried on, but the most comfortable ones looked like the kind of thing a unicorn would have nightmares about after eating too much cheese. Why? I’ve done the family Christmas presents, except for my littlest nephew. I’ve bought many many socks. Souvenirs and Christmas presents for our hosts. I bought myself a new handbag, to the universal disapproval of my children. “What an ugly handbag” said the Horror. “Nice man bag” said Muffet. “Erm” said the Moose. I’ve always wanted a Crumpler bag, it’s light, spacious, waterproof, has lots of secret pockets and they’ve changed the material so it doesn’t wear a hole in your clothes. This isn’t it’s best angle, but I’m very fond of it, so ner. What have I left to do? Clean the oven and inside fridge. Organise someone to collect the Choir mail while I’m away. Wash everything. Bleach the school shirts. Organise a new internet provider for next year as ours is slowly fading away. Think of something small, useful and delightful to give the kids on Christmas Day. Run down the pantry. Get the dogs washed and de-fleaed. Start packing. Oh, and a lot of knitting. Such a lot of knitting. I’m going to save that for another post. OMG Crumpler have changed the fabric.. ooh I might have to buy a new one to add to my collection. And do you need a dog walker? Miss13 was asking. AND it doesn’t have the velcro closure, so you can be discreet about slipping something out of your bag. Really designed to be worn cross body, but I’ve tightened the strap way up to make it a handbag. Sorry, we don’t actually walk the dogs. We just open the back gate, they rush out, roll in a dead bird, try to rub themselves on the lounge, get a bath, and sleep all afternoon. What a life. Ooh I will def have to check the bags out. 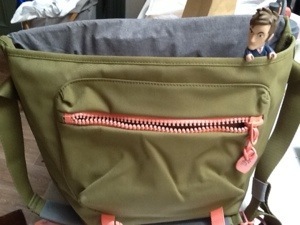 I am needing a new bag. Yes I forget about the extra large rear yard. Enjoy the trip.. very jealous.